We urge you to avoid rip offs who buy gold at dirt cheap prices. You’ll never find selling gold coins back to neighborhood coin shops, jewelry stores, pawn shops, or “We Buy Gold” locations a good deal. We can’t believe how little they pay to buy gold back. Just as you would buy gold from a long-standing firm with good reputation for honest business dealings, you should sell gold to the same kind of firm. 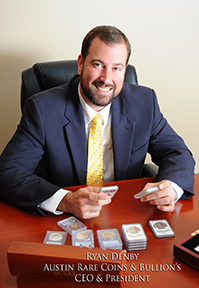 Few people realize that a firm like Austin Rare Coins & Bullion will buys a gold coin for every gold coin we sell. 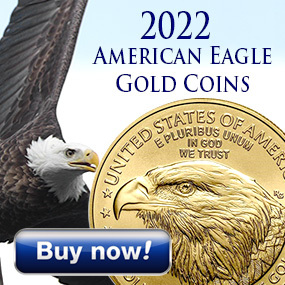 Every day we sell and buy gold silver, and rare coins from people just like you, people who live all across America. Call us, let us know what you have to sell and we’ll make you an offer– an honest and fair offer to buy gold, buy silver, buy rare coins, or buy anceint coins. Call Austin Rare Coins & Bullion at 1-800-928-6468 from 9am to 9pm Monday though Friday. Here’s how to start the process of selling your gold to us. Call, let’s determine what you have. We can buy gold coins in bullion or bars by quoting a price over the phone. We also buy silver bullion and buy platinum the same way. If you like our price, you send us your bullion. Upon arrival, we finalize the price based on the price of gold or silver that day. We call you and confirm the price which may be little higher or lower. We write out a check and mail it to you. No hassles, no waiting. It’s even easier to sell gold, silver, or platinum if you live near us in Austin, Texas. It’s quick, it’s easy to sell gold. We see clients by appointment Monday – Friday, 9am to 5pm. To make an appointment just call 1-800-928-6468 and speak to a Gold Specialist. We’re in the Northwest Austin area near the mall at 183 and 620. We’ll see that you are booked into one of our private conference rooms. When you come in, we’ll review what you have, and make you an offer. If you like our price, we write you a check and you'll walk away happy. Forget selling gold to jewelry stores, they don’t know about coins or rare coins. Jewelry stores are most likely to offer you “well below” the melt value for your coins– even if the coins you own are rare and valuable worth many times their gold or silver content alone. Avoid “We Buy Gold” stores that pop-up in grocery stores or strip malls. Some BBB reports these shysters are offering 70 - 80% of the melt value for ordinary gold or silver bullion. Prices close to current melt values are the least that you should consider selling your gold for. Never accept gold selling prices in grams. 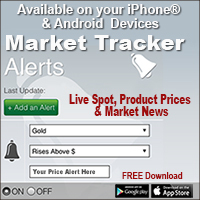 Dealers in the USA buy and sell gold and sell silver in troy ounces, never in grams. This is just a way for the “We Buy Gold” people to disguise how little they will really pay you for your precious metals. Research before you sell gold. Just like when you buy gold, before you sell your gold. A dealer who has a bad online reputation for selling gold coins should be avoided completely.